Today is the last day of “The Breakfast Club”, with the deliciously talented Madeleine Shaw, Nutrition Coach. Visit her website for more scrumptious recipes. 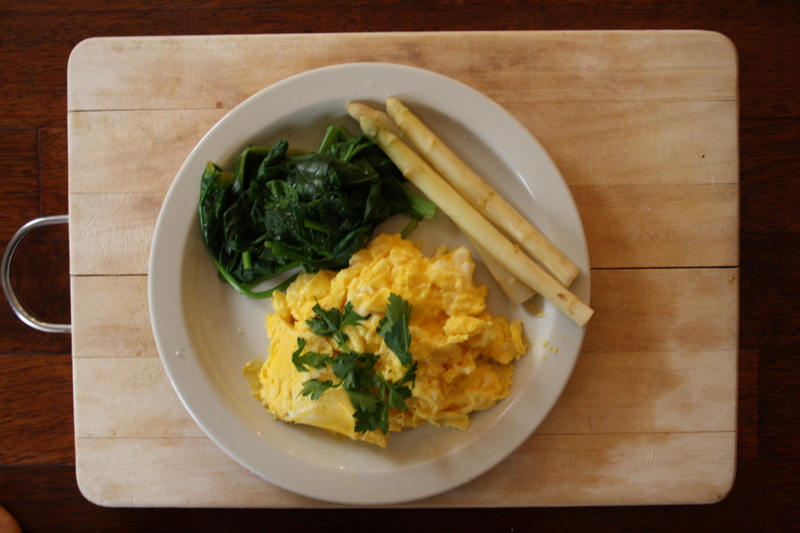 Creamy scrambled eggs with asparagus is by Madeleine. Creamy scrambled eggs, how I do love these delights! Eggs are amazing as they are cheap, quick to cook and packed full of goodness. One egg contains 6 grams of high quality protein and all 9 essential amino acids. You cannot get another food that is more complete than that! Asparagus are coming in season and it is so exciting to get these crunchy veggies into your body. They are very cleansing which is very beneficial with the seasons changing. Cut the stalks off the asparagus; pop them in a pot with boiling water and boil for 5 minutes. Whisk the eggs with the salt and yogurt until the yolks are totally emulsed. In a fry pan at a medium to high heat, melt the coconut oil and then add the egg mixture. Let this cook for a minute then with a wooden spoon stir/scramble the eggs around for another minute. Plate your eggs next to your asparagus and drizzle the lemon all over your eggs and asparagus.